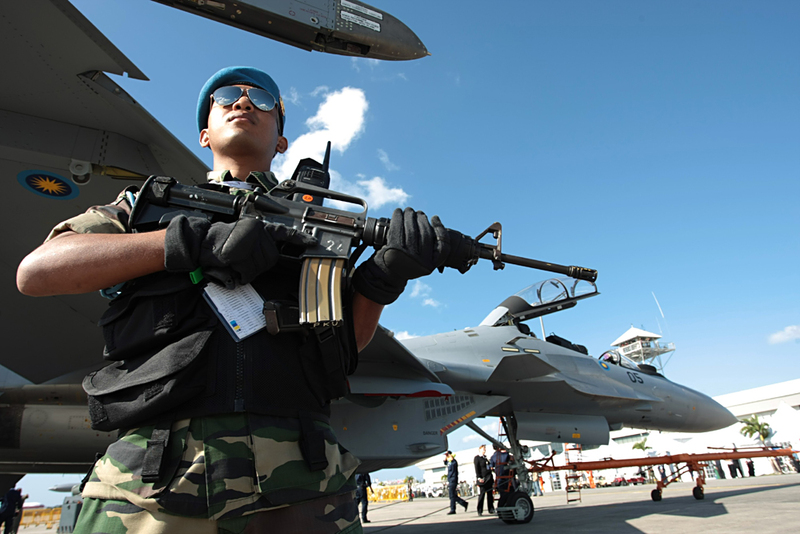 Malaysian soldier armed with rifle stands on guard near Royal Malaysian Air Force Sukhoi Su-30MKM jet fighters at the 2007 Langkawi International Maritime & Aerospace Exhibition (LIMA 2007) in Malaysia. Malaysia wants to save money by leasing Sweden’s Gripen jet fighter, but Russian Sukhois offer better value, more firepower and geopolitical spinoffs that Sweden can’t match. The Royal Malaysian Air Force (RMAF) is shopping for new fighter aircraft to replace its fleet of 12 MiG-29s acquired in 1995, but with its oil revenues taking a hit Kuala Lumpur is unable to rustle up the cash. In 2014, instead of buying outright, Malaysia took the decision to lease 36 to 40 new jets. Sweden’s Gripen is now the front runner, with Dassault and Sukhoi pulling back. The Swedes have also promised to sweeten the deal by throwing in a couple of airborne early warning and control aircraft into the package. The advantage of leasing is that because Malaysia won’t own the Gripens, the RMAF won’t be stuck with ageing aircraft in, say, 15 years time. The Swedes will take their jets back after the end of the lease agreement, and might resell them to some cash-poor country. The disadvantages, however, outweigh this so-called advantage. Depending on operating conditions and contract clauses, leasing can be as costly as full ownership. While the RMAF will have a set of shiny new planes at zero or low upfront costs, Malaysia will ultimately have to pay for fuel, maintenance, parts and insurance. The final bill could include depreciation costs as well. In this backdrop, Russia’s proven Su-30 Flanker (of which Malaysia flies the MKK version) and the even more advanced Su-35 (which neighbouring Indonesia has ordered) offer more bang for the buck. The Su-35’s fuel consumption of 0.19 km per litre, while carrying a payload double that of the Gripen, is clearly impressive. Plus its low fuel consumption even at speeds faster than the speed of sound is a key advantage because endurance can be the difference between winning a dogfight or exiting it. The Su-30 also fares well in the medium fuel efficiency category at 0.58 km per litre. It is also an example of a heavy aircraft with extremely long legs. Note that both Russian jets are heavy fighters that are considerably larger than the Grippen so their superior fuel efficiency is indeed remarkable. Let’s not forget that we are dealing with warplanes, not cars, here. Leasing could translate into restrictions on the operations of the aircraft. For instance, would Malaysia be able to base the aircraft where it wants? Will leasing restrict geographic regions to which the planes can fly? There is no comparison. The Sukhoi is the wolf of the skies, whereas the Grippen is the poor man’s fighter. Grippen is better suited for the less threatening and relatively peaceful skies of South America than the increasingly turbulent skies of the Asia-Pacific. Malaysia’s fighter choice is also influenced by its geography. Since the country is bordered by seas, a twin-engine fighter is the ideal requirement. This is because losing an engine over sea usually spells serious trouble for single-engine aircraft. This requirement meant that in the first round the Grippen got the boot. That it has bounced back is solely due to the cost factor. This is something that the Malaysians will have to decide – whether national security should take a back seat to costs. Both the Su-35 and the Su-30 will offer the RMAF a bunch of benefits that it won’t get with the Gripen. Sweden is a political lightweight and will offer Malaysia little in terms of international support in global and trade forums. Only Russia can do this. In pure military terms, the Sukhois dominate the skies in a way the Gripen never can. The key to this dominance is super-manoeuvrability, which is the defining characteristic of the Flanker family. Aviation expert Bill Sweetman explains how this can decide the outcome of an air battle: “Unpredictable flight paths challenge the guidance algorithms of any missile system.” Basically, by making the missile work harder the Flanker effectively reduces its range. At the same time super-manoeuvrability boosts the Flanker’s own missiles. “Rapid nose-pointing can permit a short-range missile launch with a greater kill probability,” writes Sweetman. One of the little known facts about the Flanker is that its super-manoeuvrability reduces its visibility on radar screens. Mikhail Simonov, the aircraft’s legendary designer, explains: “Super-manoeuvrability should be looked at as a system of manoeuvres for close aerial combat. Once the pilot receives a signal that his plane is being tracked by enemy radar, the first thing he needs to do is to go vertical. While gaining altitude and losing speed the aircraft starts to disappear from the screens of radars that use the Doppler effect. While the Flanker’s manoeuvrability is stupendous, its long range also comes into play in aerial combat. This allows it to perform repeated probes and U-turns – a Cold War Russian tactic – that can leave its opponent disoriented, exhausted and vulnerable in a dogfight. DID points out that the Su-35’s NIIP Tikhomirov Irbis-E passive phased-array can reportedly detect and tracks up to 30 air targets, simultaneously engaging up to eight. It can also reportedly detect, choose and track up to four ground targets, and engage two. Detection ranges of over 400 km have been reported for airborne targets. Plus, the Su-35’s service life is 6,000 flight hours, with a planned operational life of 30 years. That should give Malaysia plenty of time to prepare for the fifth generation fighter era. The Su-27 and its subsequent versions such as the Su-30, Su-34 and Su-35 mark a historic shift in air-power from the United States to Russia and the countries that use Russian defence technology. Whether in India, China, Indonesia, Venezuela or Malaysia, the Flankers have degraded the offensive and defensive capabilities of their western and western-backed opponents. The RMAF is currently satisfied with its Su-30 MKK jets. Additional jets can be procured easily and at a bargain. No additional infrastructure needs to be imported for inducting more Su-30s. This won’t be the case with the Gripens as entire support systems will need to be purchased as well. Plus, it will take years of training before Malaysian pilots can master these jets. Currently, the Indian Air Force offers support, advice and training for the RMAF because the Indians own the same Sukhoi jets. Having such support close by in Asia is handy. With the Gripen, there won’t be that comfort factor.